Thank you to all participants and DBT Judo for hosting! Kangeko is just around the corner, taking place on Saturday December 10th from 11am-1pm at the Denver Buddhist Temple Judo Dojo. Access to the gym will only be through the orange door on the second level of the parking garage at 20th and Larimer Street. The temple front gate at Lawrence Street will not be open. Free parking in the garage will be available courtesy of Sakura Square Management. Parking passes will be issued at the venue. Parents are welcomed to join judoka on the mat for the warmup portion of the workout which will include yoga and interval training. Please print and sign the attached waiver prior to the workout (including parents that wish to participate in the warmup). All judoka must have a current USJI, USJF or USJA membership. We look forward to an exciting CJL year-end event. Hope to see you there! The PDF-format file in the link below contains the results of the 2016 Denver Classic. The Denver Classic Judo Championship was held November 5, 2016 at Johnson and Wales University in Denver, CO. There were 203 entries from Colorado, New Mexico, Nebraska, Wyoming, Kansas, Michigan, and Minnesota. The winners of the men’s open division was Ajax Tadehara from the Olympic Training Center. The runner up was Kedge Zawack of Denver Judo. The winner of the women’s open division was Katie Sell, also of the Olympic Training Center and the runner up was Alyssa Zawack of Denver Judo. The Open Champions each received $250.00 and a championship belt. We were also pleased to host a kata competition. There were demonstrations of 5 katas, judged by senseis Barry Hoffman and Hideki Hayashi. The overall team award was won by Denver Judo, followed by the Olympic Training Center and Hyland Hills Judo. The PDF file in the Google Drive link below contains the entry package for the 48th Northglenn Judo Championship, scheduled to take place on September 17, 2016 at the Northglenn Recreation Center. Congratulations to Kayla Harrison and Travis Stevens! Congratulations to Travis Stevens and Kayla Harrison for medaling at the Rio 2016 Olympics! White and Yellow Belts ONLY. The entry form for Doc's Novice Tournament is attached to this email. The event will occur on August 6th at the Northglenn Recreation Center. I am looking to start a monthly open workout with various host clubs throughout the state of Colorado. We did this in Missouri and it was a huge success bringing the state together. My thoughts are we host a Saturday workout 10am – noon. $10 entry fee. $5 goes to the CJL, $5 goes to the host club. We have time for instruction and randori; the host club runs the practice. After the workout ends, if so desired, we can all grab lunch together somewhere close by, enjoy food and a drink, and tell tall tales of the good old days. This will not replace the open workouts hosted by Northglenn on the first Tuesday of every month at the Northglenn Community Center at 6:30pm. These are great workouts and I highly encourage you to attend. I was always nervous that I couldn’t make it on time because of getting off work late and battling traffic but they set my mind at ease and are happy to see you on the mat whenever you can get there. With that said, it’s still better to be on time, but sometimes adulthood makes that difficult. For the Saturday workouts, these are the dates I was thinking and I need volunteer host clubs. And if there is a tournament or other scheduling conflict that I am not aware of, will you let me know? November 12 or 26 (I know the 26th is Thanksgiving weekend but sometimes you just want to get away and throw someone). The host club for November can choose the date. November 18 -21 – IJF Veterans Tournament – Ft. Lauderdale, FL - if any veterans player (over 30 years old) is planning on going down to this tournament, there is a group of us renting houses with fellow judoka from St. Louis, Chicago, and Memphis. Let me know if you are interested in joining us. It will be a good time. November 22-23 – IJF Veterans Training Camp – Ft. Lauderdale, FL– Train with a legend! The great Yamashita is running this camp. 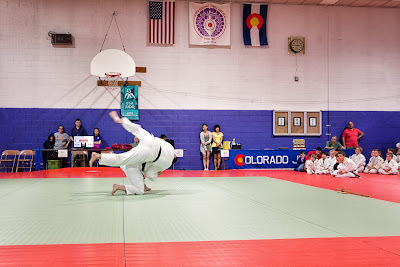 Last thing – we have a new Colorado Judo League facebook page to go with our CJL facebook group. I would love any content or events that you would like to add. We have so many amazing judoka in Colorado I would really like to share your badassness. I don’t know if you can add pictures and posts yourself or if Marcos or I have to add it, but either way, we’d love to show you off. Attached is the flyer for the Joshi Judo camp that will be held at the Colorado Center for the Blind on July 22-24. We have women from all over the country flying in for the event. For 3 days of camp, the preregistration fee is $200 if mailed in by June 30. Like I was telling you at the CJL meeting this weekend, if you have any female athletes who would like to come but cannot afford the fee, we have scholarships where they can help work the event in lieu of payment. Either the sensei or the student can call or email me to get this set up. My sister took me to my first Joshi Judo Camp when I was a teenager and it changed my life forever. 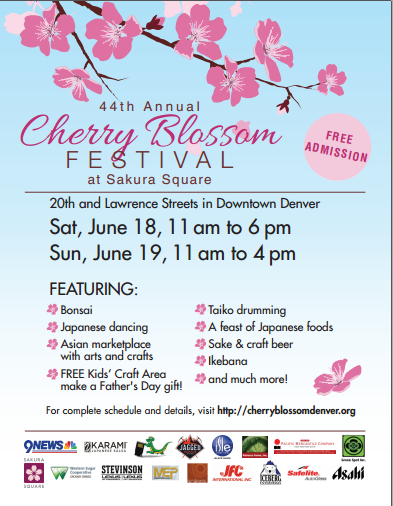 That is why when I moved to Denver, I asked my sensei, Eiko Shepherd, if we could host it here since sensei-Fukuda's passing, this event moves about to give this opportunity to women in other parts of the country. Please have your athletes reach out if they would like to attend but need assistance. This is not something they would want to miss and is something they will never forget. On June 5th, the Board of Directors elected new officers for a two year term. As the outgoing president, I wish the very best to the new Executive Committee and well as thank the outgoing committee for all of their hard work. I believe that much has been accomplished in the past two years as evidenced by the items that are listed below. I ask that all of the CJL clubs get involved to make Judo in Colorado the best. Sunday, June 5, 2016 at 3:00 p.m. Your votes for officers for the next two years is very important. Please represent your club at this meeting or send your designated representative. If you or anyone in your club is interested in running for a Board position, please solicit representatives of your club and let us know. Representation by all of our CJL clubs strengthens Judo in Colorado. Your vote is important. Professor Jigoro Kano's principle of "Jita Kioye"-"Mutual Benefit and Welfare" is fundamental in the success of our Colorado organization. Please call or email with any questions. See you on Sunday. We are inviting the states of Iowa; Nebraska; Colorado; Missouri and Oklahoma to this years Kansas State Games. We have come to your tournaments, for years, now come to ours. Weigh-in: 8:00 a.m. - 9:00 a.m. Competition: 10:00 a.m.
Friday, July 1. Day-of entries accepted with a $5 late fee. The Colorado Judo League Coaching Clinic was held on March 20, 2016 at the Highland Hill Judo Club. Sixteen coaches took part in the clinic with Senseis Moreau, Mercer and Agena teaching the clinic. It is with deep sorrow that we report the passing of Sensei Bob Wyatt. 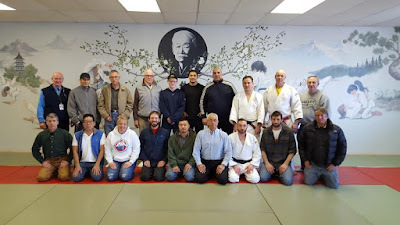 “Bob, along with Sensei Oscar Pate, are considered to be the founding fathers of Hyland Hills Judo. In 1968 Oscar and Bob started the Westminster Judo Club in Oscar's basement. Our heartfelt condolences go out to all of his family and friends. 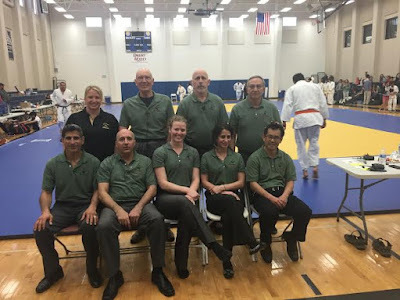 The Rusty Kanokogi Fund for the Advancement of U.S. Judo was established in 2009 to provide direct financial assistance to aspiring female judo athletes with successful competitive records who have the potential to achieve even higher performance levels and rankings. Judoka in need of financial assistance for items such as travel, uniforms and specialized coaching may request up to $5,000. Online applications must be submitted by 5p.m. EST on Friday,April 1, 2016. Grants will be awarded during the second quarter of 2016. We recognize that you have a great organization for women and men alike that aims to make them better judo competitors. Because of this, we are asking for your help in promoting this valuable and exciting opportunity. Here’s what we are asking you to do: Place a brief grant description on your Web site, in your schedule/events calendar or in your e-newsletter, and link it to the guidelines and application for the Rusty Kanokogi Fund for the Advancement of U.S. Women’s Judo Grant. Also, discussing this grant with any and all female judo competitors that you know would help spread the word immensely. We want to make this as easy as possible, so feel free to use the grant description provided (see below electronic signature). Anything you can do would be greatly appreciated, and we would like to thank you for your support. Robert Tanaka for Tokyo 2020! CJL will be conducting a coaching certification clinic at the Hyland Hills Judo Club, 9165 Lowell Blvd., Unit D, on Sunday, March 20, 2016. 1. Fill in open treasurer and delegate-at-large positions to finish terms until this year’s elections. Everyone is reminded that the OTC Winter Classic is scheduled for january 16, 2016. An entry package is attached. After nearly serving for nearly two years as our CJL treasurer, Steve Shigaya has accepted a position in Seattle, Washington. We wish to thank Steve for all of his hard work. We are looking for anyone interested in filling this role until we have Board elections in June. There is a delegate-at-large position on the Board that is still open if someone is interested in filling this position. The Colorado State Championships are slated for May of this year. Any individuals willing to chair and/or help organize this event? Any club interested sponsoring this event? Elections for new Board members are slated for June. Let us know if you are interested in running for a CJL Board position. Please let me know if you are willing to support your Colorado Judo League in any of these areas. Wishing everyone a healthy, happy and prosperous New Year.